If you’re given 1 minute and 43 seconds to have a one-way chat with your FATHER on some of the MOST IMPORTANT LESSONS IN YOUR LIFE that you’ve learned from him, what will you tell him? Maybe you can share these lessons, help inspire our followers and a get chance to win a NOVUHAIR GIFT PACK for your dad. Step 1: LIKE and SHARE the promo. Step 2: Share in the comment section at least 1 of the most important lessons in life that you’ve learned from your father. One (1) major winner will be chosen via electronic raffle to receive one (1) 200ml. 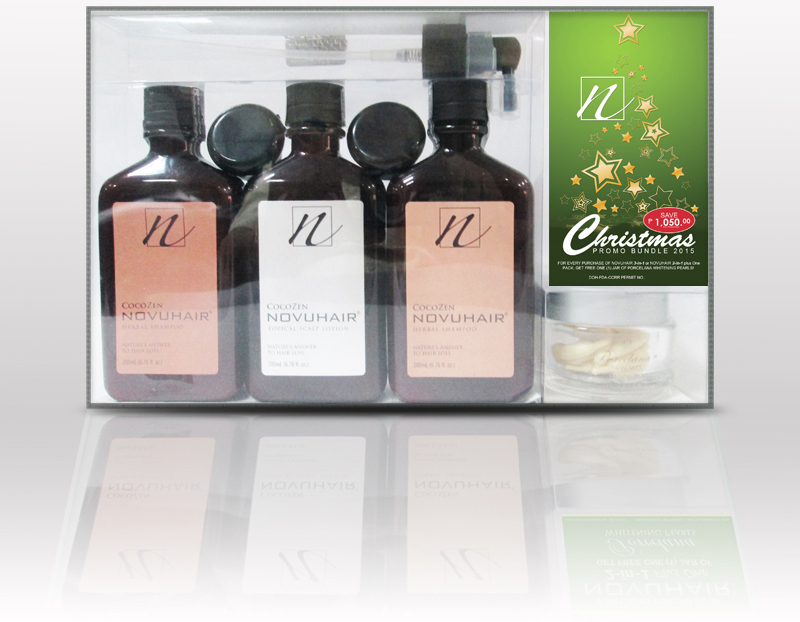 bottle of NOVUHAIR Topical Scalp Lotion and seven (7) minor winners to receive one (1) NOVUHAIR travel kit each. The winners will be announced at NOVUHAIR’s official Facebook page on Tuesday, June 19, 2018. Our authorized Facebook administrator will notify and verify the winners via private message. 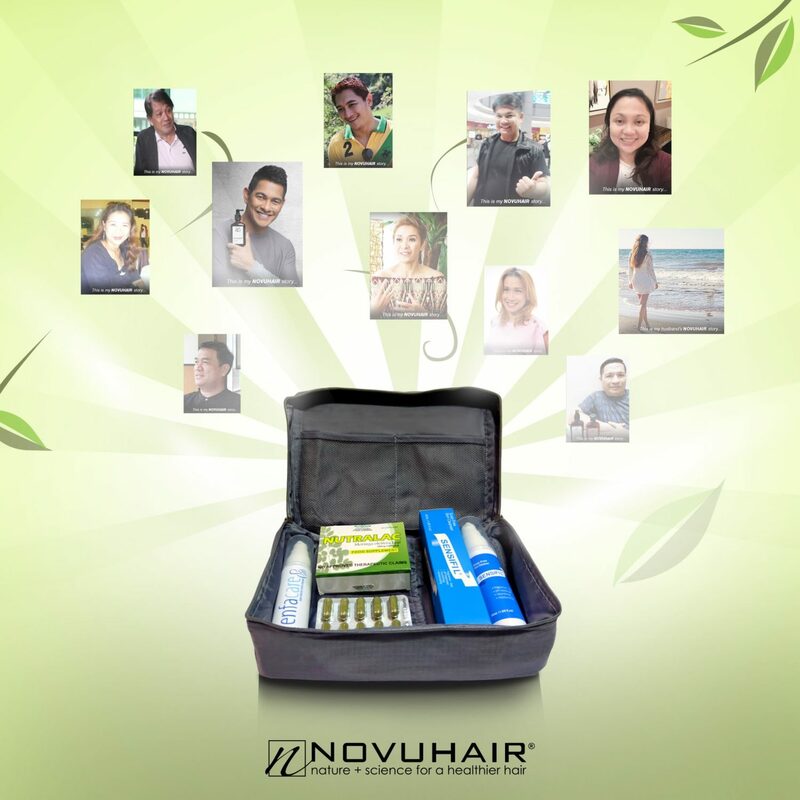 Share your comments and get the chance to win exclusive NOVUHAIR Travel packs. State at least 1 reason why you prefer to choose natural to remedy hair loss with #ichoosenatural #novuhair and earn 1 raffle entry. Maximum of 3 entries per FB account is allowed. Promo will run from March 01-31, 2018. 3 winners will be drawn and announced weekly: March 12, 19, 26 & April 2. For more information, call our hotlines 413-6570 or 0922-8830575. 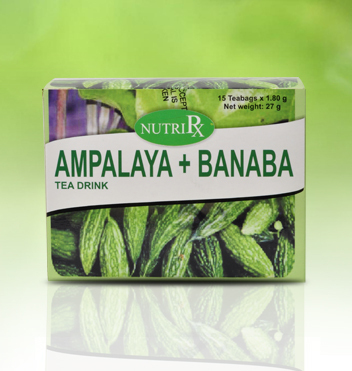 SAVE P 815.00! For every purchase of NOVUHAIR® 3-in-1 pack or NOVUHAIR® 2-in-1 plus One pack, get FREE one (1) bar of Porcelana Whitening Soap 120g. plus one (1) tube of Porcelana Whitening Lotion 200mL. Promo period is from October 15, 2014 to January 31, 2015. This promo is exclusively available at Watsons. This offer is good while supplies last. 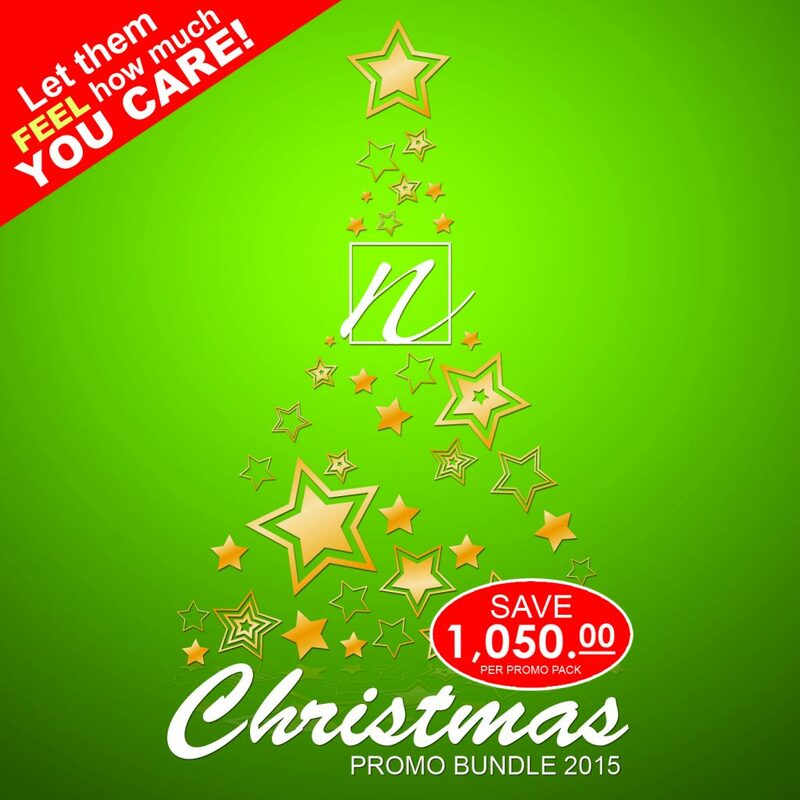 For more information, you may call NOVUHAIR® hotlines at 413.6570 or 0922.8830575. 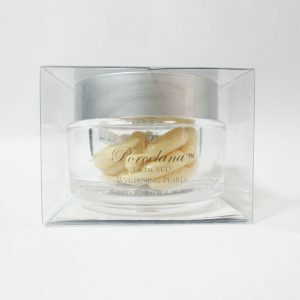 Porcelana Whitening Soap 120g. – formulated and enriched with the fresh aroma of chamomile extract (Pure Flower) with honey and shea, blended with grapeseed, papaya extracts and Vitamin E, a complete sytem that lightens, moisturizes and restores the skin’s natural transparency and protects the skin from the sun’s harmful ultraviolet rays, makes it soft, smooth and young-looking. Porcelana Whitening Lotion 100mL. – contains antioxidant that prevents skin discoloration and lightens complexion enriched with Chamomile extract with antiseptic and anti-bacterial properties, ideal for sensitive skin, provides anti-aging benefits, hydrates and keeps skin smoother. 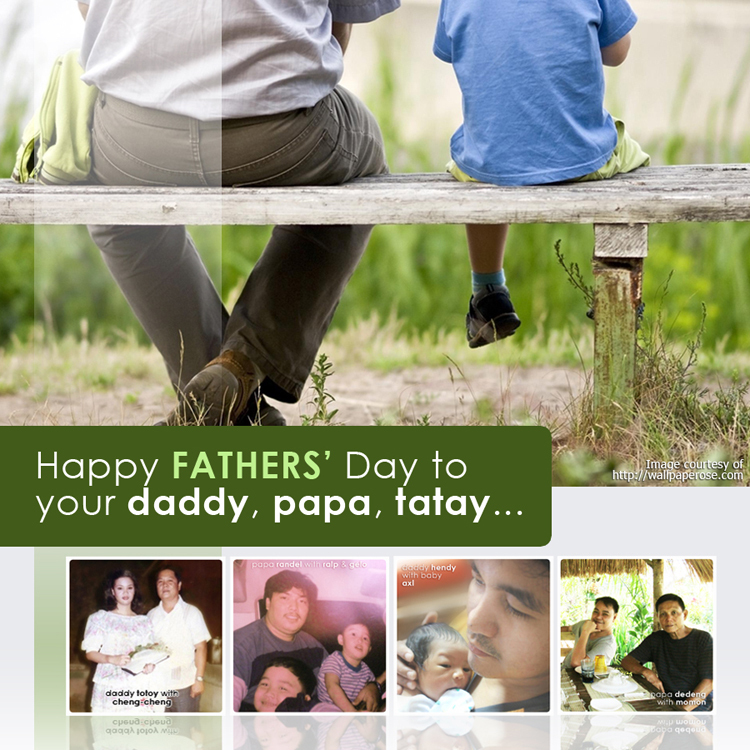 Daddy, papa, tatay… It’s your turn to show how much you love him. Join our Father’s Day Promo, win a special gift pack and make him feel very special! Step 1: Using your Facebook account, visit our page – Novuhair Official then LIKE the page. Step 2: Upload any photo with your father (new or old). One entry per Facebook account is allowed. Step 3: Say something about your photo and include the hashtag ( #novuhair ) at the end of your message then post. We shall notify the first 20 qualified entries through Facebook. Upon confirmation, please notify us where to deliver the gift pack. Each qualified entry shall receive a SensifilTM Soap-Free Skin Cleanser gift pack (8 pieces 5mL./sachet) good for 2 weeks usage. From the 20 qualified entries, the first 5 entries shall get additional 50mL. bottle of Novuhair Topical Scalp Lotion each. 50 mL. bottle of NOVUHAIR® topical scalp lotion : NOVUHAIR® is a topical scalp lotion combining standardized herbal extracts with essential oils and co-factor nutrients, specifically chosen for their hair growing properties. NOVUHAIR®Topical Scalp Lotion penetrates the scalp to rejuvenate the hair follicles, provides optimum nutrition to help combat hair loss and thinning of hair and improves blood circulation in the scalp which contributes to the stimulation of hair growth. 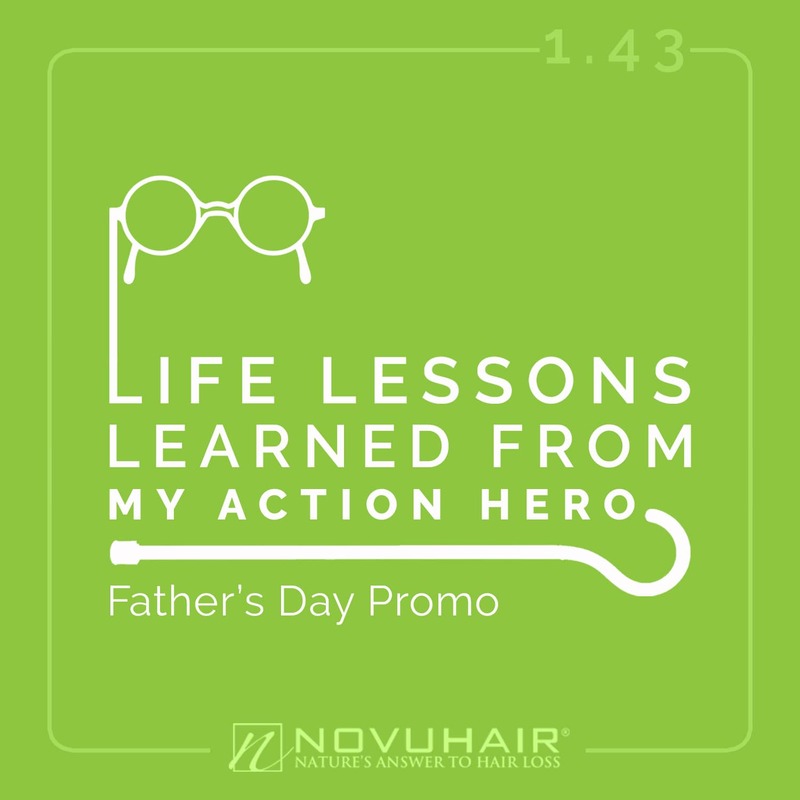 NOVUHAIR® Topical Scalp Lotion helps arrest hair loss when used twice-a-day consistently. Within 4-6 weeks, you can look forward to the benefits of NOVUHAIR® Topical Scalp Lotion in addressing excessive hair loss, retarding further hair thinning and improving the overall cosmetic properties of your hair. For some, with continuous usage, it may also help increase the number of hair growth noticeable on the onset of the 4th month and onwards. 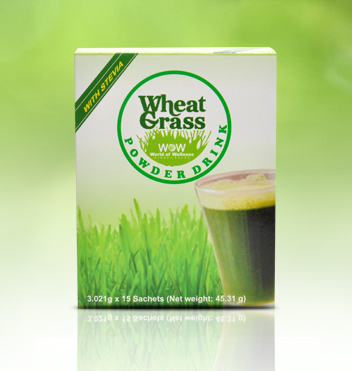 This benefit is dependent on the amount of commitment and frequency of usage and how you embrace wellness as a lifestyle. The result may vary from one person to another. Option 1: Daily use. Spray liberal amount of Novuhair Topical Scalp Lotion on the scalp then massage for at least 5 to 10 minutes. Wash your hair using a herbal Shampoo then rinse. Towel dry and style as desired using non-alcohol-based hairstyling products. Option 2: Leave on. Wash your hair using a herbal shampoo then rinse and towel dry. Spray liberal amount of Novuhair Topical Scalp lotion on the scalp. Massage for at least 5 to 10 minutes then leave on. Style as desired. SensifilTM Soap-Free Skin Cleanser is a gentle, effective skin cleanser for sensitive, dry and normal skin. It moisturizes and conditions the skin while removing all traces of dirt, impurities and other unwanted residues without stripping the skin’s essential moisture. With the addition of Virgin Coconut Oil, Aloe Vera and Vitamin E, you can enjoy a clean, soft, and smooth skin each use. Ammonium laureth sulfate is a mild, primary anionic surfactant that is widely used as basic surfactant for shampoos and gels. Direction for use: Apply SensifilTM Soap-Free Skin Cleanser on wet skin and manage gentle for thorough cleansing. Rinse of with water. 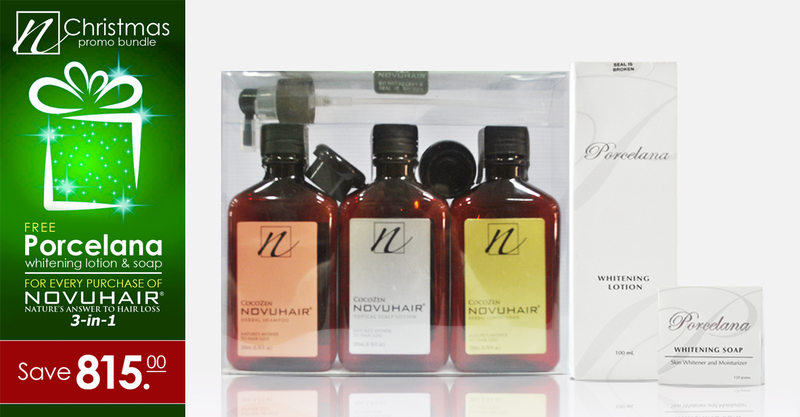 Always look amazingly beautiful with the Novuhair 2-in-1 plus One pack with a free Head-to-Toe Beauty Bundle. Help bring back your thick and healthy hair with the Novuhair 2-in-1 plus One Pack. The Novuhair Herbal Shampoo helps keep your scalp clean and healthy with stronger follicles through its pure botanical extracts content. Use the shampoo every day to make your hair stronger and healthier. The Novuhair Topical Scalp Lotion maximizes the benefit of the Novuhair Herbal Shampoo as it aids in hair growth and helps prevent hair fall. Packed with natural herbs, essential oils and co-factor nutrients, the Novuhair Topical Scalp Lotion aims to help solve hair problems. The Scalp Lotion penetrates deeply into the scalp to help rejuvenate, nourish and moisturize the hair while it also helps stimulate hair growth and prevent excessive hair loss. This package also comes with a free Head-to-Toe Beauty Bundle that will help you keep and improve your existing beauty as it comes with a Porcelana Whitening Soap, CocoZen Seaweed Oil, CocoZen Soothing Foot Scrub with VCO, Porcelana Sunblock with SPF 30, Porcelana Whitening Lotion and Porcelana Roll-On Deodorant with Calamansi. 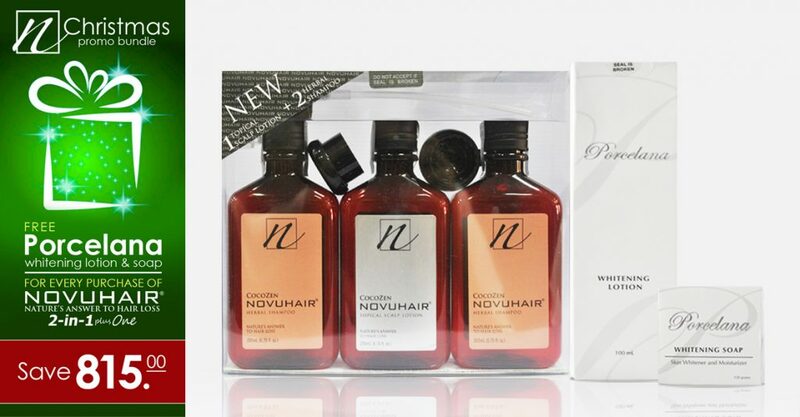 Valid for a Novuhair 2-in-1 plus One Pack + Head-To-Toe Beauty Bundle. 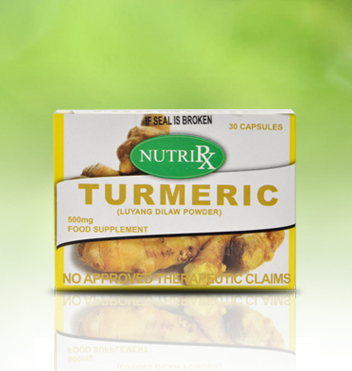 Product is available for pick-up from and delivery 3 days after purchase, valid for 2 weeks. Ensogo Office is open for redemption from Monday to Friday, except on holidays. Product is available for pick-up 3 days after purchase, valid for 2 weeks. If not picked up within this period, product will be discarded. Please present voucher upon claiming the product. Shipping begins 3 days after purchase, valid for 2 weeks. Please fill in delivery detail after clicking ‘Buy’ and ensure that the information is correct. Shipping will be made from Monday to Saturday, from 8:30AM to 6:00PM (not valid on holidays). Terms apply unless otherwise noted. o The company reserves the right to withhold delivery if the shipping and contact details are incomplete, particularly the contact number. o Shipping fee is calculated according to weight, quantity purchased and shipping location. Shipping fee will be disclosed upon filling in the shipping detail. o Prepare your ID so you can present it to the shipping crew on your scheduled shipping date. Your ID should serve as a key for claiming your product. Should you wish to have your product claimed by a representative, please make sure to present a photocopy of your ID and a signed authorization letter so that your representative can claim the product for you. o After 2 failed delivery attempts, product will be stored at Ensogo then will be discarded if not claimed within 30 days. o Upon receiving, please inspect immediately whether the product is in good condition. o This is transferable and may be given as gift. o Price is inclusive of service charge and VAT. o All paid transactions are subject to refund policy. o This cannot be used in conjunction with senior citizen card, and any discount card or promotion. https://www.novuhair.com/wp-content/uploads/2014/05/Ensogo-Mothers-day-Deal-Proposal.jpg 338 750 admin http://www.novuhair.com/wp-content/uploads/2016/04/Novuhair-New-Logo-270-61.png admin2014-05-07 11:39:502016-05-12 17:22:34Looking for a perfect gift for Mothers’ Day this May 11, 2014? Good news! Buy Novuhair Topical Scalp Lotion 200mL. or Novuhair Combi pack or Novuhair 3-in-1 pack in the following Watsons stores and get a chance to pick any of the following items for FREE! 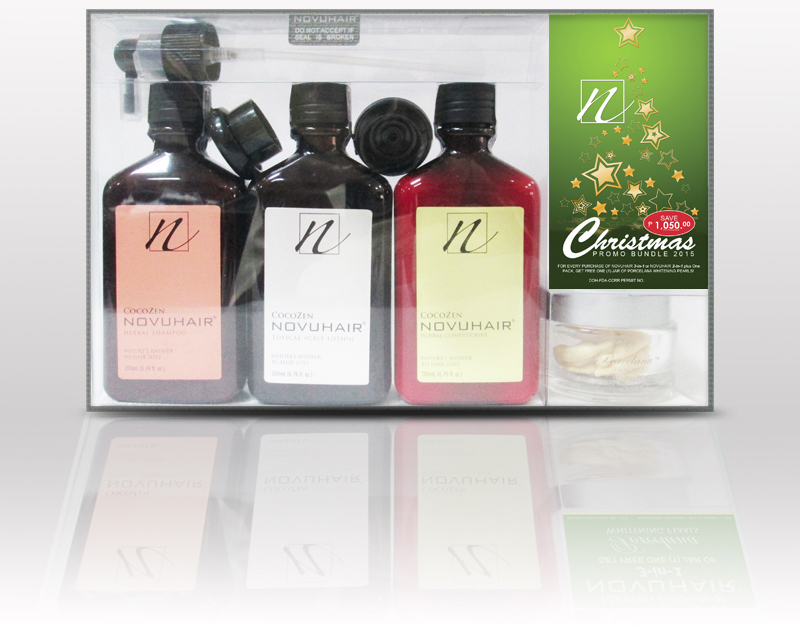 Purchase any Novuhair pack and have a chance to pick an instant prize at Novuhair’s booth. Simply present your official receipt to our assigned promodizer. Our promodizer will submit to the branch manager or supervisor your proof of purchase for verification and approval. Once approved, you can pick a stub at the booth and bring home your instant prize! The promo will run from September 15-October 15, 2013. For more information, you may call Novuhair hotlines at 413.6570 and 0922.883.0575 from Monday-Friday, 8:30am to 5:30pm.